Dr. Krueger holds a DBA in Finance from the University of Kentucky, and MBA from Minnesota State University and a BS from University of Wisconsin-Eau Claire. Prior to TAMUK, he taught at UNC-Charlotte (1986-1989) and the University of Wisconsin-La Crosse (1989-2010), where he was chair of the Finance Department (1993-1999). The April 26 program was a presentation of Dr. Krueger's "Overview of the Coastal Bend Economy & Kleberg County". This presentation was originally presented on March 6 at the Economic Forum & Luncheon at the Student Union Building on the TAMUK campus. It was a very informative presentation with great insight to our local economy and how it compares to our neighbors, Jim Wells and Brooks counties. We look forward to the second annual Luncheon next year. Click here for presentation. (The presentation has been converted from Microsoft PowerPoint to Google Presentation. If there are format errors, please let me know so they can be corrected). 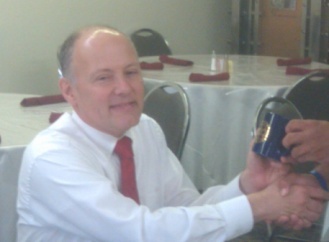 Our speaker for April 19 was City Manager Vince Capell. Vince was hired as the city manager in April 2011. He came to Kingsville from St. Joseph, Missouri, where he served in several capacities, including City Manager (9 years), Assistant City Manager, Finance Director and Budget Manager from 1990-2011. Prior to public administration, Mr. Capell was an audit manager (1979-1983) for Ernst & Whinney (now Ernst & Young) before opening his own CPA practice (1984-1990). At our meeting, Mr. Capell spoke about changes he has implemented in city operations, current and future city projects, and the city's financial standing. 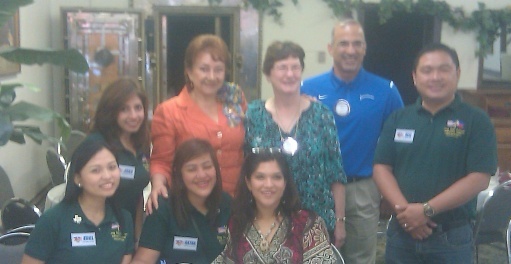 On April 12, the Rotary Group Study Exchange team from the Phillipines were our guests. The team leader is Perfecto "Pitok" D. Sueno, Jr. 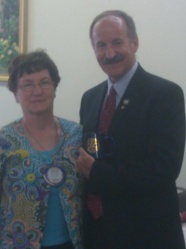 He is a CPA with numerous business ventures and a member of The Rotary Club of Marbel. He has served in a host of Rotary positions, including club president (1986-1987), Assistant Governor (2007-2008) for District 3860 and District Secretary (2009-2010). He and his wife, Lutchie, became Major Donors of the Rotary Foundation in 2010. Temujin B. Ocampo - Temujin is a journalist, and he has been a news correspondent and anchor for more than 17 years. Retrina Espe Fuentes - an attorney, who since passing the bar in 1999 has served in private practice, as a public defender and currently is a Government Prosecutor. Jamila Balchand - Janu graduated from medical school in 2004 and finished her medical residency in 2009. She is presently the school physician reliever at Ateneo de Davao Uninversity, a medical examiner for an agency that assists Filipinos seeking overseas employment placement and as a junior consultant at the Ricardo Limso Medical Center.